Mindfulness is fully experiencing and simply being aware in the present moment without looking through the lens of judgment or blame. The two types of practice are formal and informal. In formal mindfulness meditation, we set aside time to sit silently with awareness of our breath, physical sensations in the body, emotions and thoughts. Otherwise known as Vipassana, translated as “insight", which means having a clear understanding of what is happening as it happens. It is considered an insight meditation because it calls for bringing attention to the body and mind without trying to change or alter our experience in any way. Informal mindfulness is paying attention to what we’re doing while we’re doing it and can be practiced while eating, walking, exercising or any other activity during the course of our day. Again, it is about noticing our emotions, physical sensations in the body and thoughts while being engaged in our experience. Think of it as connecting with your "observer within." Practicing mindfulness allows us to open up to the possibility of becoming a witness to our own process, which enables us to make a choice to override and break free from our conditioned reactions that don’t serve us and move towards a more neutral response. We can’t control much of our external environment, such as what other people do that might adversely affect us or certain problematic circumstances, but we can control how we manage and regulate our experiences. In other words, we can work towards responding instead of reacting, which entails taking a moment before saying or doing something we may later regret or realize had no effect whatsoever on the original problem. It’s a methodical and very effective way of handling stressful situations. 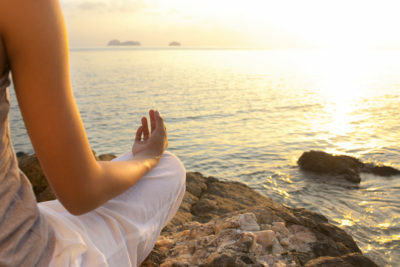 Research conducted by Dr. Richard Davidson, professor of psychology and psychiatry at The University of Wisconsin and Jon Kabat-Zinn, professor at University of Massachusetts has shown that mindfulness practices cause healthy changes in the brain and the body and increases well-being, life satisfaction and peace of mind. In addition, they found increased activity in the areas of the brain associated with positive affect and emotional regulation. Even though one of the many benefits of practicing mindfulness is feeling relaxed, mindfulness is not a relaxation technique. As much as we are not “doing” anything when we practice mindfulness, it is a very active process. It calls for being alert, focused and in the moment. This process carves out new neural pathways in the brain, meaning we are creating a new habit, so that over time it takes much less effort for us to see things in a neutral or more positive light, as long as we continue to practice. Mindfulness techniques help us to slow down and recognize our tendencies and habitual patterns. When we allow ourselves to slow down and cultivate “being” instead of “doing” we can change our maladaptive patterns that cause us mental, physical, emotional and spiritual suffering. It’s really not about fixing or eliminating anything within ourselves. Again, it is simply about being and not striving to do anything. By engaging in this practice, we begin to learn about ourselves on a deeper level. It’s pretty simple, really, and anyone can do it! Mindfulness is a skill. A very important skill if we want to live a fulfilling and gratifying life. It’s like learning to ride a bike: it’s challenging at first, but keep practicing and it becomes second nature. Be patient and gentle with yourself, put the time in and just do it! "You can't stop the waves, but you can learn how to surf."